Fits into one of the six amplifier card slots of the F6-MF mainframe chassis to provide up to 250 watts of power. By buying this product you'll earn up to 203 Rewards points. 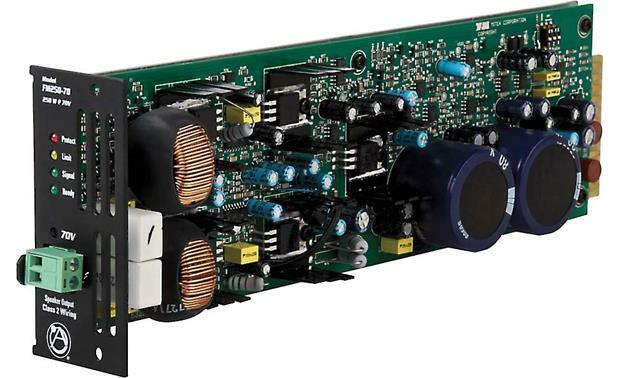 The Atlas Sound FM250-70 amplifier module can provide up to 250 watts of power for your 70-volt distributed power speaker system, playing music and speech clearly and loudly enough for all to hear. Each FM250-70 fits into one of the six amplifier card slots of the F6-MF mainframe chassis, connecting internally to the master unit's power supply and inputs. A Dip switch lets you set the amp's input sensitivity, to maximize the signal over background noise, and engage a high-pass filter, to clear any low rumble out of the mix. Rear-panel status LEDs let you know how the amp's behaving. Overview: The Atlas FM250-70 is an amplifier module is designed to work specifically with the Atlas F6-MF power rack, which can hold up to 6 modules. 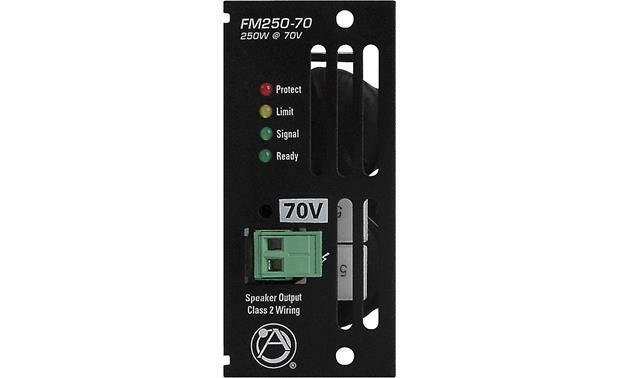 The FM250-70 module can output 250 watts for 70 volt speakers and features a defeatable Limiter and a High-Pass Filter. 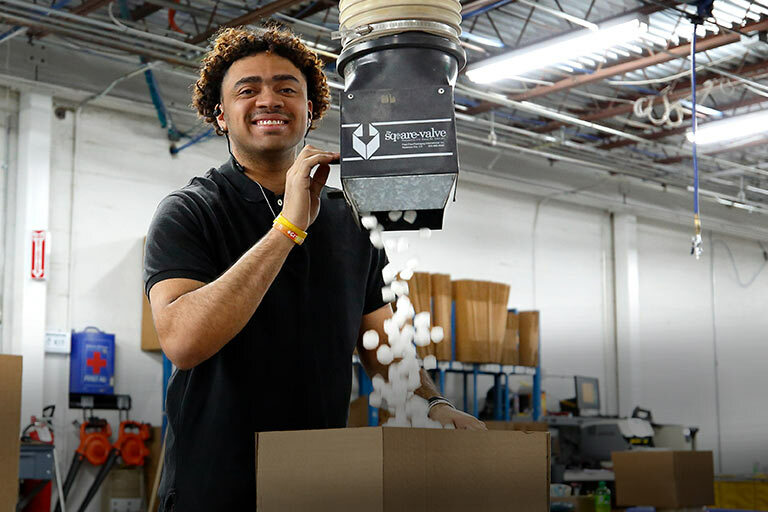 It's Class-D amp technology is designed to be 90% efficient, allowing the amp to run cooler and consume less energy than conventional amplifiers. Installation: The FM250-70 module includes a multi-terminal strip on the rear of the PC board that lines up with a contact slot on the F6-MF power rack. The card is then secured in place with 2 front panel screws. Signal input to the card is through the rack, which has six 3-pin Euroblock connectors on the back of it, along with Level dials for each channel. The front of the module includes a 2-pin Euroblock connector for connecting 70 volt speakers. 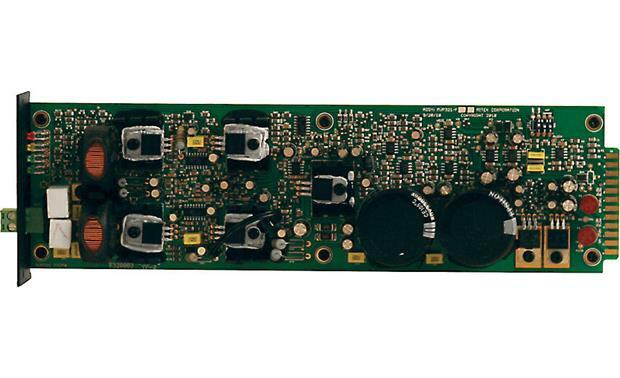 If powering 4Ω or 8Ω speakers, the FM250-4 module can be used. This installs into the F6-MF power rack in the same manner and provides the same power output for running 4/8 ohm speakers. On: When both switches are On, a 100 Hz / 12 dB per octave High-Pass Filter is engaged. Ready: Will light green when the FM250-70 power module is installed and the F6-MF is powered on. 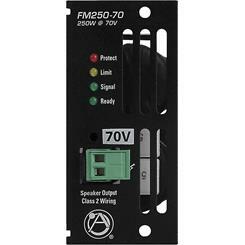 Signal: Will light green when the FM250-70 amp module's output signal produces a minimum 1 watt signal. Limit: If the FM250-70 amp module's function switch is set to Limit, the the LED will light yellow acting as a maximum level indicator. If the amp module's Limit function is off, the LED acts as a Clip indicator. Also, under low impedance loads, the LED serves as a current Limit indicator. 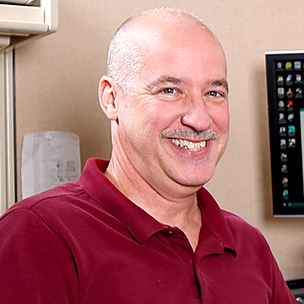 Protect: Will light red to indicate a speaker short, too high internal temperature, or too low of a speaker impedance. Continuous Power @ 1kHz, 30 mins. Dimensions: Width - 1.5", Height - 3.4", Depth - 10.4"
Searches related to the Atlas FM250-70 Amplifier card module (70V output only).